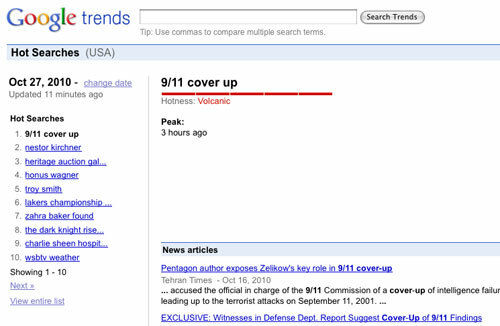 Discussion of a “9/11 cover-up” has become the #1 search term on Google’s hot trends, following a prompt on the Alex Jones Show today. And not without good reason. Former Governor Jesse Ventura joined Alex in a special broadcast to unravel some of the latest smoking guns released on video reluctantly by NIST following a lawsuit. Key evidence has come out in this new batch of video where top officials, fire fighters and others clearly discuss witnessing secondary explosions in the towers. Chief among these latest revelations are statements captured by then director of the FBI in New York, Barry Mawn, who asks fire fighters on video if “That tower got a secondary hit?” Ensuing comments from fire fighters indicate they did witness such an explosion. Separately, other newly released video shows fire fighters on 9/11 discussing multiple explosions. “There was an explosion… the third explosion the whole lobby collapsed on us,” states one fire fighter. Why NIST tried to suppress this now-released video has become obvious. These newly discovered statements– which NIST attempted to censor even after releasing– only magnify the mountains of evidence, including video from the day of 9/11, already pointing towards A) a massive, coordinated systematic cover-up and B) indications of an inside job, use of explosives at the WTC, the intent of WTC complex leaseholder Larry Silverstein to demolish WTC Building 7, prior knowledge by key government sectors & intelligence agencies and beyond. This new evidence is compelling and demonstrates that the tide of 9/11 truth has not stopped. We thank the International Center for 9/11 Studies for their important role in getting this vital evidence from NIST via the lawsuit. We also thank listeners, supporters and activists who’ve all helped to get this message out and drive “9/11 cover-up” to the top of Google’s search trends, which will, in turn, generate new attention to the subject and help spread the message of truth.